Apple reversed course this year, opting to allow for user-swappable memory on the new Mac mini. The procedure isn't as straight-forward as it could be, so AppleInsider walks you through it. There are many configuration options when choosing your mini between the processor, RAM, storage capacity, and an upgraded Ethernet port. Most of these cannot be changed and are soldered to the main board, but the RAM is upgradable post-purchase. How to replace the RAM was one of the most frequent questions we received after our in-depth 2018 Mac mini review, so we are here with answers. But look, here's the basic deal -- you can break things and you will be sorry. You can destroy your new computer if you aren't careful, and it is not our fault. Read the procedure in full before you decide if this is something you want to do. Importantly: this procedure does not void your warranty, however anything you break in the process does. Also, keep the old RAM chips. If you need to bring your Mac mini back to Apple for any reason, they won't do a thing with it if your RAM is installed. So, if that's the case, put the RAM back in, before you head off to the Genius Bar. To start, you need a few things including a TR6 Torx security screwdriver, T9 Torx screwdriver, P5 screwdriver, a plastic spudger, a pair of DDR4-2666, 1.2V, PC4-21300, unbuffered, non-ECC RAM sticks, and an anti-static wrist strap that you know how to use properly. There are many options out there for RAM upgrades, some on Amazon (Hynix, MemoryMasters) and more from OWC. You can have up 64GB total, or two 32Gb sticks. Using the plastic spudger, carefully remove the plastic bottom of the Mac mini by starting at the end closest to the ports. Use the TR6 Torx security screwdriver to reove the six screws holding the Wi-Fi antenna/shield plate into place. Remove this, while at the same time being careful not to damage the antenna wire located on the left side. The antenna wire is held to the logic board with a screw. Remove the screw, then use the spudger to dislodge the cable. Now remove the updated fan/cooling system to expose the RAM hiding beneath by unscrewing the four screws. Once the screws are removed, tilt the fan towards the top (carefully) and use a spudger to dislodge the cable. Use a T9 Torx screwdriver to remove the two centrally located screws holding the logic board to the case. Using the spudger once more, dislodge the cable towards the top of the logic board. Using your fingers, disconnect the power supply from the top right. Rotate the Mac mini 180-degrees, then use your thumbs to apply gentle and even pressure to the heat sink to remove the board from the case. Remove the four T6 screws keeping the RAM shielding in place. Swap in your new, higher capacity sticks. After ensuring the replacement RAM is securely in place, reverse the above steps. Since Apple isn’t advocating doing this, it voids the warrantee if you screw up. Don’t forget that. Is it worth it for cheaper RAM? Your last sentence (question) is a good one though. Seeing how involved this is, I'd consider just biting the bullet and getting "more" RAM at time of purchase. It does not explicitly void the warranty. Also as the forum software doesn't always catch all of the main site's images, if you're following along, you're best off doing so with the video or from the main page. Just checked MacSales/OWC and their RAM for this model costs $169.99 vs the $200 upgrade price Apple charges ($188 if you qualify for their EPP and (possibly) educational discounts). I use MacSales all the time but regardless of the warranty, the price difference doesn't make sense to me considering the lack of ease in replacing it. Using cheaper RAM is not something I do or recommend so for those who just have to be able to change or upgrade RAM, good luck. disclaimer: OWC charges $1079.99 for a full 64GB of RAM vs Apple's $1316 (EPP price) so it might be worth it if you really want to spend that much money on a Mac mini. from https://support.apple.com/en-us/HT205041 Couldn't quickly find actual warranty but when Apple says something like this, it sounds to me like they aren't allowing it. 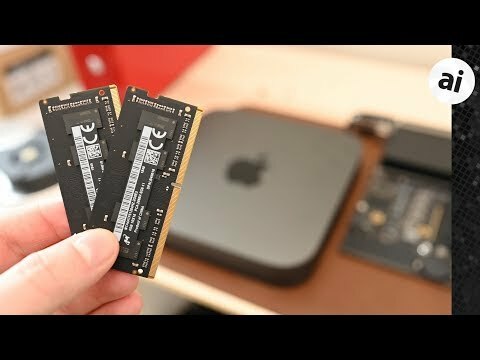 To upgrade the memory in your Mac mini (2018), go to an Apple Store or Apple Authorized Service Provider. Employee Purchase Plan. I wasn't an Apple employee but Apple provides a special Apple Store for people at certain companies. The discount isn't what it used to be but at least it's a discount. I used to work for a large government contractor and this discount is through our employee store, which works for retirees. We used to get the educational discount but Apple changed requirements moving us to a different discount program. We were a very large Apple product installation at one time. I worked for a national bank brand and they had an Apple discount too, dunno how prevalent these programs are. We asked. We're also very clear in our warning about the procedure. They can be nice but no discounts on iOS devices, except adapters. I believe Macs are limited to the 10% discount educational buyers get while AppleCare is almost always discounted and a good buy. 2018 Mac mini base model $751+$89 vs $799+$99 (AppleCare). Larger difference in AppleCare cost on MacBooks. Confession: im too cack-handed not to screw this up. All those different screws etc. I think id get them muddled up etc. It's a great video though. perhaps watching this at the same time and putting each series of screws clearly on a mat with labels may help! RAM prices go down over time. If you see your Mac purchase as a long-term investment, but money is tight, it's nice to know that if you end up needing more RAM in a couple of years, you'll be able to buy it for considerably much less than it costs to have it preinstalled right now. Sometimes, if you're in the sweet spot. Sometimes the reverse is true and when a new RAM standard comes out, the previous one gets more expensive. DDR3 is running high because no one is making it anymore. I use an ice cube tray. RAM is a commodity, with fluctuating prices. About five years ago, gigabyte to gigabyte, RAM was half the price it is now. Only if upgrading the RAM to 32GB/64GB is where it's really more cost-effective to do it yourself. The small price difference for 16GB vs. DIY doesn't justify the time and arguably the risk of opening it up for those that don't have the steady fingers. That’s nearly half off Apple’s markup. Definitely worth it. And OWC will probably install it for you. Remember when Apple used to be user-friendly? Flip the entire motherboard on a Powermac out into the open with just the flip of a latch. Likewise pull out all the guts in a G4 Cube with the pull of a handle. RAM slots quickly accessible in a Powerbook just by pulling the battery, no tools at all required. Ah, the good, old days. What's wrong with doing that again, Jonny Ive? Are looks the only things that matter now, with no regard for function? Those days are long gone. Time to move on. The reality is most people will never crack open their PC after purchase. Never. There is no point in doing the extra engineering for these machines to accommodate the < 1%. I'm okay with that. Yes it is. Apple memory is rebranded quality memory that you can get 50% cheaper elsewhere. I prefer to order their Mini with minimum memory they offer and then get Crucial or Kingston memory that serves for years stably. I have even upgraded processor to 64-bit on their old Mini (pull-out from Dell laptop) It reviewed that Mini for few years more. Was it worth? Sure it was (making 32-bit hardware into 64-bit at higher clock for $50 cost). Same happened with Mini Server 2012. Getting basic version with 4GB RAM and upgrading it to 16GB right away made quad core server running faster than most of newer dual core Minis until today. The original memory was also nice extra for present for someone who was happy to upgrade iMac 5k (as it used the same memory type) from 8GB to 12GB RAM for free. If you are scared then you should not do this however few of us have past experience even with building PCs.